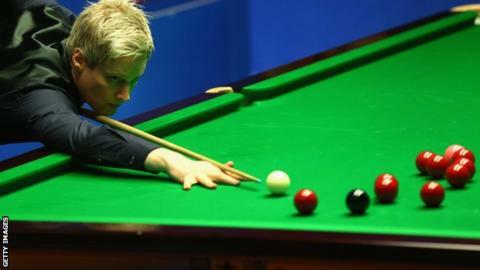 Former champion Neil Robertson suffered a shock 5-3 defeat by Noppon Saengkham in the first round of the China Open. Australia's Robertson, who won the event in 2013, made two century breaks but went out as Thailand's Saengkham, 23, progressed with runs of 70 and 80. Home favourite Ding Junhui failed to reach the first round as he lost 5-1 to England's Lee Walker in a qualifier held over to the main venue. World champion Stuart Bingham beat Cao Yupeng 5-0 to reach round one. In the first round, John Higgins beat China's Zhou Yuelong 5-2, fellow Scot Graeme Dott beat Wales' Matthew Stevens 5-1 and Alfie Burden beat fellow Englishman and world number nine Joe Perry 5-0. Scotland's Stephen Maguire beat Gary Wilson 5-3 but countryman Alan McManus lost 5-4 to Mike Dunn.